24 jumbo beads, 8 pattern cards, 3 laces and suggested|s activities. 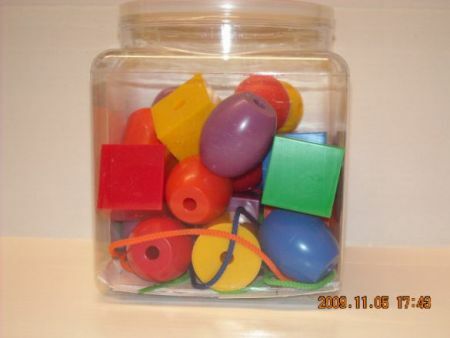 The jumbo beads come in geometer solids of cube, barrel, sphere, cylinder and in colors of red, yellow, blue, green and orange. The length and/or diamter of each geometric solid are 1.5".